Now also available in Danish, Swedish and Norwegian language, as well as English. One of the biggest translation project in Iceland's history. The entire corpus of the Sagas of Icelanders together with the forty-nine Tales connected with them, in five leather-bound hardback volumes. Queen of Denmark, Margrethe II, writes the preface in the Danish translation (Islandske sagaer) (read more about the publishment here in Danish). THE COMPLETE SAGAS OF ICELANDERS are the first English translation of the entire corpus of the Sagas of Icelanders (íslendingasögur) together with the forty-nine Tales connected with them. The Sagas of Icelanders are forty narratives of adventure and conflict, set in the Viking Age but written down in the vernacular by anonymous authors in Iceland several hundred years later, during the 13th and 14th centuries. Their action spans the whole world known to the Vikings, but the stories mainly centre on the unique society they founded in Iceland, depicting the men and women who settled there and their descendants. Thirty translators were carefully selected for the project, including leading international scholars and university teachers from seven countries who have studied and written on Nordic medieval literature and culture. All the translators are native English speakers and writers. Careful editorial planning and coordination ensured that translators followed the same translation policy and produced the same high level of accuracy and readability. Coordination work included use of consistent English terms for key words and concepts, recurrent proverbs and phrases, and other cultural realia. Spelling conventions for personal and place names were normalised, as were translations of nicknames occurring in more than one Saga. Eleven Icelandic medieval specialists then carefully checked the translations against the original Icelandic texts to ensure accurate renderings and returned them to the translators for revision. A further revision stage concentrated on the English style, when fourteen native English-speaking scholars read through the translations before the translators gave them a final polish. The publishers are confident that these extensive editorial efforts have produced sound, quality translations. While they reflect the expertise of scholars in this specialist field, a prime concern was to produce a text in smooth and readable modern English. There are probably few examples of comparable coordinated translations of an entire literary corpus into another language. The Complete Sagas of Icelanders include extensive but unobtrusive reference and background material for a deeper understanding of the world of the Sagas. The comprehensive introduction depicts the world of the Sagas, their subject material, the location and society where they take place, their artistry and, not least, their characters, and assesses their place in world literature. Following the course of events, such as the voyages of discovery to Vinland, or finding the scene of a conflict on the detailed maps puts the Sagas in a new perspective. A large number of key concepts have been translated consistently from one Saga to the next. As an aid to understanding, they are given in italics in the first instance they occur in each saga and comprehensive explanations are given in the glossary. "Nature Spirit (vættur): There were various kinds of nature spirits that the Icelanders (and other Scandinavians) believed in, and sometimes gave sacrifices to. There are early references to elves (álfur) in mainland Scandinavia. Like their modern-day equivalents, the "hidden people" (an expression used in both Norway and Iceland), these would have been of human size..."
One of the most important features of many Sagas are the verses, often recited by principal characters in the stories. This is a linguistically complex poetry, full of imagery and energy, which often includes rich and diverse references to Norse mythology. Explanations are provided alongside the translation in the Sagas themselves for the metaphorical word-puzzles known as kennings, while more background and detail are found in this separate reference entry. All told, the Sagas of Icelanders have a cast of thousands of men, women and children. This index lists some 700 persons who appear in two or more Sagas. 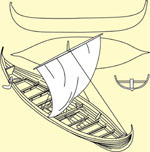 Explanatory diagrams show details of ships, houses, etc. together with a survey of Saga society. Tables indicate, among other things, the reigns of the principal Norwegian monarchs of the period, historical events taking place in Iceland and the terms of office of the leaders of the Icelandic commonwealth, the Lawspeakers. Includes the five leather-bound hardback volumes.